Soon after the release of Sonic Boom: Rise of Lyric in the US a few developers independently published a large number of concept arts showing the different stages of the game creation. Of particular interest are experiments with characters design and level sketches. Sonic and Eggman could suffer much more serious redesign, and Lyric (the main villain of the game) was originally owl. In addition, Chao were considered, whose appearance differs greatly compared to the other games. Andrea Ritsu from Sonic Stadium has collected all these arts in one folder, and just in case we also reuploaded them to the gallery . Official Sonic Merchandise: T-shirts 50% off! 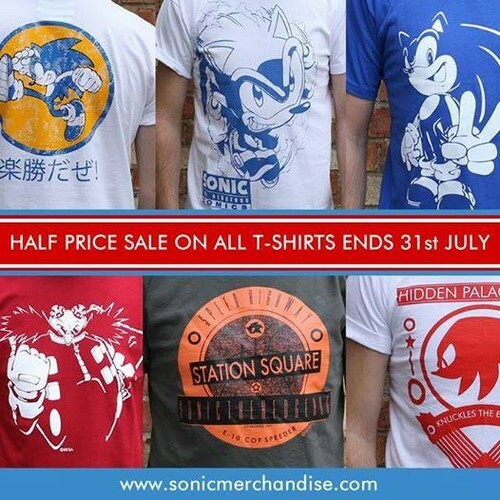 As a special Summer promotion, the Official Sonic Merchandise is giving customers 50% off all ordered T-shirts! The site delivers various shirts, with characters from Eggman to Knuckles to the Blue Blur himself. This sale will run until the 31st of July, so if you are still considering, there's more than enough time! Get 23% off purchases at Official Sonic Merchandise! For this weekend only, the Official Sonic merchandise provides customers with a discount code as an early celebration for Sonic's 23rd anniversary. With this, every product that you purchase will get 23% off when you're checking out. A great way to save yourself some money and celebrate the 23rd anniversary earlier! Do note that the main site's currency is Great Britain Pounds (GBP) but does deliver to every country. You might want to use a Currency Converter to calculate what it will cost you exactly . However, you can also switch to different countries by clicking the flag symbols at the bottom right of the screen.